Each is accessible to beginners, but still scenic enough to satisfy more seasoned riders. You don't need to go far outside of Portland to take in Oregon scenery by bike. You don't have to be willing to endure intense elevation gains or high-mileage rides, either. We've compiled a list of five campsites that are bikable within a day from Portland public transit stops. All of these routes are on paved roads, or have the option to avoid dirt paths so you don't need a mountain bike, and none of them are punishing. Each is accessible to beginners, but still scenic enough to satisfy more seasoned riders. The ride out to Milo McIver is one of the chillest bikepacking day trips you can take from Portland, and ideal for beginners. The route is entirely flat bike paths and low-traffic roads. From the MAX stop, head east along the Springwater Corridor Trail to the protected bike lane along Southeast 17th Avenue, which takes you past Milwaukie's waterfront park before linking up with the Trolley Trail (there's an MAX Orange Line stop right next to the Trolley Trail too, but the Milwaukie waterfront route is scenic and all downhill). Flat and low-key, the Trolley Trail is a straight shot through quiet neighborhoods out to Gladstone. After Gladstone, most of the route is along Clackamas River Drive, which offers river views through the trees. There's no bike lane, but since it's low-speed and residential, you can use the road as your bike lane. Things are cushy at the campground, too—a Mount Hood viewing platform, hiking trails along the Clackamas River and, best of all, bike repair stations. Columbia River Highway may be the most popular bike route through the Gorge, but there are plenty of rides on the Washington side of the river that are just as spectacular. Washougal River Road snakes along the river, past a state park and up to swimming holes and waterfalls. From the Gateway Transit Center, take the Interstate 205 bike path out of town and across the Columbia River. 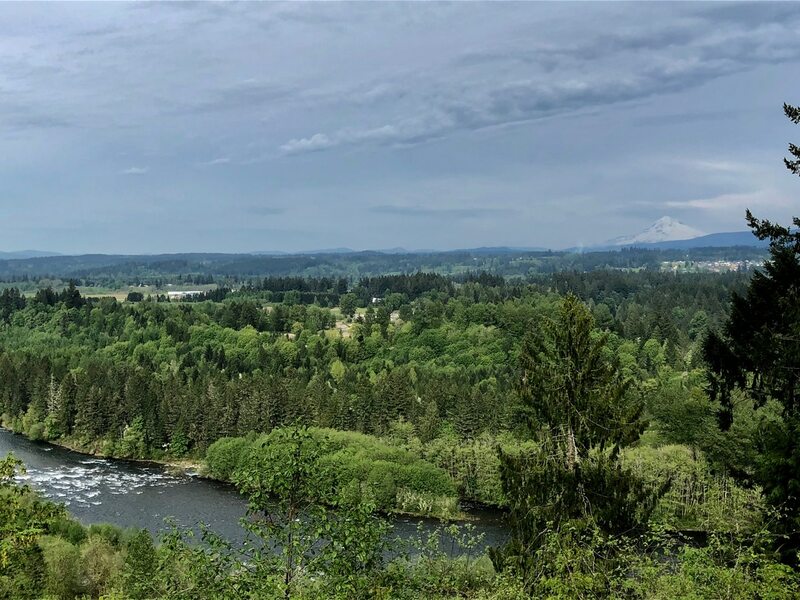 Then, follow the sleepy Evergreen Highway and Southeast 6th Avenue along the Columbia until you eventually reach Washougal River Road, which takes you north to Dougan Creek Campground. Unfortunately, you can't reserve a tent site at Dougan, so aim to get to the campground relatively early in the day. But the campsite is almost as scenic as the ride. At the bottom of tranquil Dougan Falls is an emerald swimming hole, and Naked Falls is less than 2 miles away. Like the ride out to Milo McIver, the route to Champoeg uses the Trolley Trail to get out of Portland. But instead of following the Clackamas River when the trail ends in Gladstone, take the McLoughlin Boulevard bridge to Oregon City. After Oregon City, you'll ride on country roads past wineries, over creeks and through open farmland. Canby is the last town you'll ride through, and a good place to stock up on supplies so you can keep your pack light for the first 20 miles of the ride. To head out of Canby, take Knights Bridge Road over the Molalla River, or stop for a dip if it's a hot day. After that, it's less than 10 miles to the bucolic campground right along the Willamette. The Historic Columbia River Highway is one of the most iconic bike rides in Oregon, and last November, the 6 miles west of Ainsworth State Park reopened for the first time since the Eagle Creek Fire. Designed for optimal views of the Gorge, the highway passes by Multnomah and Horsetail falls, and biking is an ideal way to soak in the scenery. Getting there from Portland is easy. Just take the Marine Drive Trail out to Troutdale, where the historic highway begins (you may want to ride on the sidewalk for the mile of Troutdale roads in between Marine Drive and the highway). There is a decent ascent in the center of the route—about 900 feet up to Vista House—but it's worth it for the view, and the rest of the ride is fairly flat. Unfortunately, many of the hiking trails around Ainsworth's campgrounds are still closed from the fire, but there is plenty more exploring by bike to do along the Columbia River Highway if you're feeling restless at your base camp. Though this route has the highest elevation gain on this list, there are only two climbs—near the beginning, through the West Hills, and near the end, after you enter the park. Everything in between is mostly flat. This route starts at Union Station in Northwest, then zigzags though Forest Park on the Saltzman Road trail. But if climbing dirt roads isn't your thing, you could start your ride from the Hillsboro Airport MAX Station instead, and make your way to Northwest Meek Road from there. It'll cut your mileage and elevation gain in half. West of Highway 26, the route strolls past farms until you get to the tree-lined, totally car-free Banks-Vernonia State Trail, which takes you straight into the park, for the last 10 miles of the ride. There's plenty more biking when you get to the campsite—including some single-track trails—and sweeping views of rolling, fir tree-covered hills.